Shilpa Shetty all set to marry Raj Kundra, Latest Bollywood News,Shilpa Shetty Getting Married,Shilpa Shetty tying the knot with Raj Kundra. Seems like it is wedding time in Bollywood, after Amrita Arora and Ayesha Takia, it’s Shilpa Shetty who is all set to marry her long time beau, Raj Kundra. As per reports, Shilpa is ready to say I do by December 2009. Raj chose the best day to pop the marriage question to her on Valentine’s Day with a diamond ring. Shilpa Shetty is all excited to accept the marriage proposal. Interestingly, most of the top Bollywood heroines have married to divorcees and Shilpa is following the trend. Sridevi became the second wife of Boney Kapoor, similarly, Karishma Kapoor married Sanjay Kapur, who divorced his first wife. Likewise, Shilpa is marrying Raj Kundra who got divorced from Kavita Kundra. 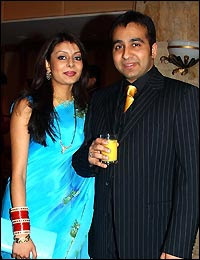 In a recent interview, Kavita Kundra, Raj Kundra’s ex-wife said that “Shilpa I living my share of life”. So, get ready to see Shilpa Shetty as Mrs. Shilpa Kundra soon.